Meet Liana Robertshaw, a 6-year member from New Jersey who thinks any adventure starts with the unknown and always bring a positive attitude as her 11th essential. A friend who just enrolled asked me to join her in a learn to belay class prior to the course at Stone Gardens in Ballard. She introduced me to the course and I was hooked. Becoming a role model for future women climbers and ambassadors to The Mountaineers. I run a SIG (Small Instruction Group) not only because it keeps me fresh with my skills but because I want to make sure future climbers and mountaineers are readily prepared and easily welcomed into this climbing community. I value being safe and staying fun, and want to ensure this legacy for future climbers. Ideally, I want to promote leadership and camaraderie within this organization. We all have a place here! 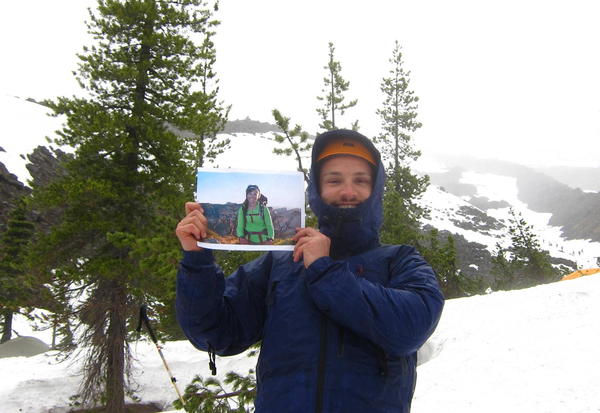 Meeting my significant other on my first Mount Saint Helens climb in 2012 (my basic year)! He was on skis and I was on snowshoes. We have now been together for 6 years! It's a tradition for us to around Mother's Day every year and dress up in a different costume each time. Last year I was a narwhal, this year a flamingo. For the past two years I have lugged a 6-pound inflatable unicorn to camp and set up a spot where we take turns sledding downhill, I think it's one of Cebe's (Wallace) favorite times of year, watching us blow the unicorn up with the unfortunately placed valve (under the tail!) and then make fools of ourselves on our wild downhill rides. One year I wasn't able to climb due to a broken leg, he brought a picture of me with him so I would be 'on the climb too'. Every day people do amazing things. If I can't be the one to do something earth-shattering, I want to be someone supporting the people who are accomplishing these incredible feats. Exploration. Any great adventure starts with the unknown. You may not make the summit but you're more aware of the territory that comes with the victory approach. What's your 11th Essential? A positive attitude, smile, and bad joke (ok, that's 3!). Post-adventure meal of choice? VEGETARIAN TACOS (only good ones!) and a cold IPA. If you could be a rock star at any outdoor activity overnight, what would it be? Is there an ice-climbing/kayaking variation? Hmmm...Greenland, here I come! Liana is an experienced climb leader with The Mountaineers, and she recently made the heart-wrenching decision to turn around rather than reaching the summit of Mt. Rainier. Read her report on the experience here.